CTV is now an official selection in the Berlin Lift-Off Film Festival Online 2019. Congrats to the cast and crew on this accomplishment! What do I really need to learn to get started in the media industry? Should I join the union to get a union job? How do I stay current in this quickly changing media landscape? Sitting at a computer all day for work is a pain in the neck! ...and the back, and likely putting you at risk for a number of health issues. Today’s expert is Dr. Edward Cambridge- a Kinesiology graduate, Doctor of Chiropractic, and an expert in spine and hip biomechanics. 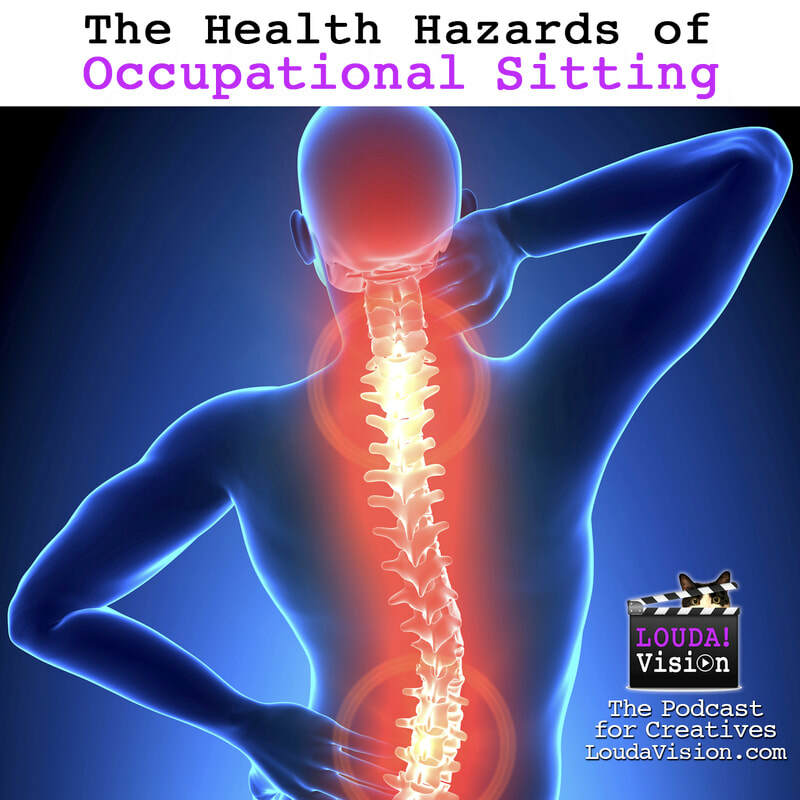 We’re discussing the health hazards occupational sitting, and how to optimize your health by adjusting your workspace. Are multiple screens causing you neck stiffness? Is your standing desk causing you back pain or soreness? Do we need to buy an expensive office chair with lumbar support? Learn how to adjust your workspace throughout the day with this new school of ergonomics. Dr. Cambridge explains the importance of load sharing, taking micro-breaks and knowing your unique time limit for sitting. I also ask how people with herniated discs can avoid surgery. Follow along at home with some sample stretching exercises you can use during your microbreaks. This is a must-listen for anyone with chronic pain or if you are worried about your sedentary lifestyle. 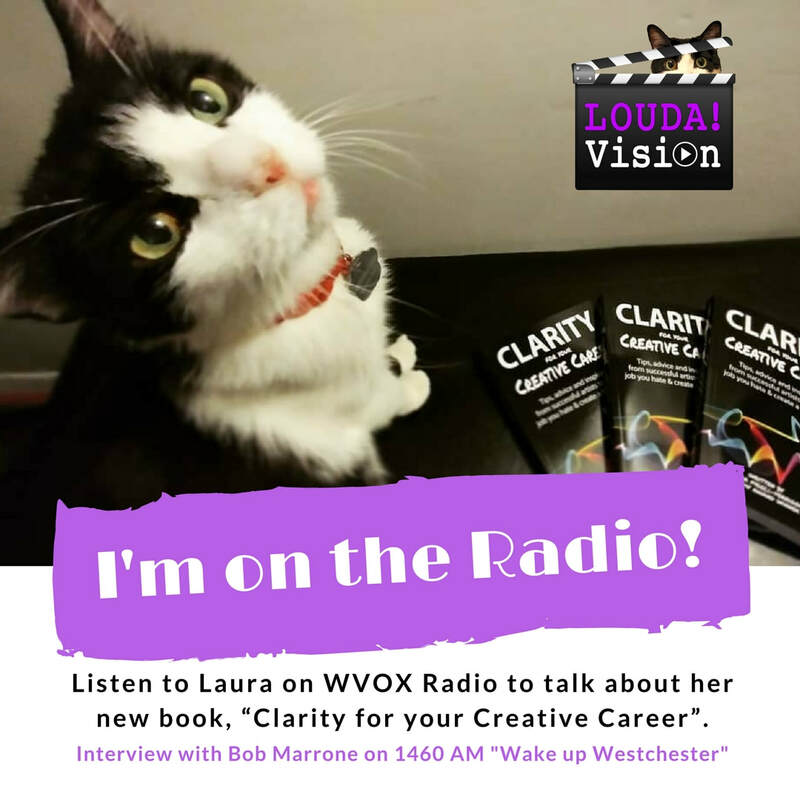 LoudaVision podcast host Laura Meoli-Ferrigon appears on WVOX radio, "Wake up Westchester" with Bob Marrone to talk about her new book, “Clarity for your Creative Career”. Learn all about how it can help you make the ideal career choices for your lifestyle. Quit the job you hate and create a life you love. Also, tips for freelancing and making money as an artist in this crazy competitive job market. Take a listen and enjoy! Audio courtesy of WVOX Radio. In December 2017, my students at the Boys & Girls Club of New Rochelle (Mascaro Clubhouse) held a fundraiser to help the club in Puerto Rico which was devastated after Hurricane Maria. The 5th grade girls created a documentary film to spread awareness. BGClub Mascaro - Puerto Rico Bake Sale from The Picture House on Vimeo. Video E﻿quipment that won't break the bank. No heavy lifting required. Here is a look at my personal video equipment recommendations based on years of testing, trial and error. The links provided here are budget-friendly and available online for easy shipping. It is very important for me to find equipment that is not heavy or bulky. These camera items will fit nicely into the backpack provided below. All tripods and lights come with their own easy carrying cases. If you have any specific questions about equipment picks, feel free to contact me. I provide tutoring and training in all aspects of filmmaking, video production and photography. Ever wondered what it would be like to pack up your life and go on the trip of a lifetime? Magdalena Reilly did just that. On this episode of the LoudaVision Podcast for creative people, this wandering soul shares the tale of how she and her husband left their 9 to 5 jobs, gave up their apartment, put everything in a storage unit, and went on a 3 month exploration of Europe to find out first-hand about eco-cities and environmentalism. Magdalena and Joseph Reilly‘s documentary film “Low White Sky” is an exploration of alternatives to our current agricultural systems, and it focuses on permaculture, vertical farming and urban gardening. 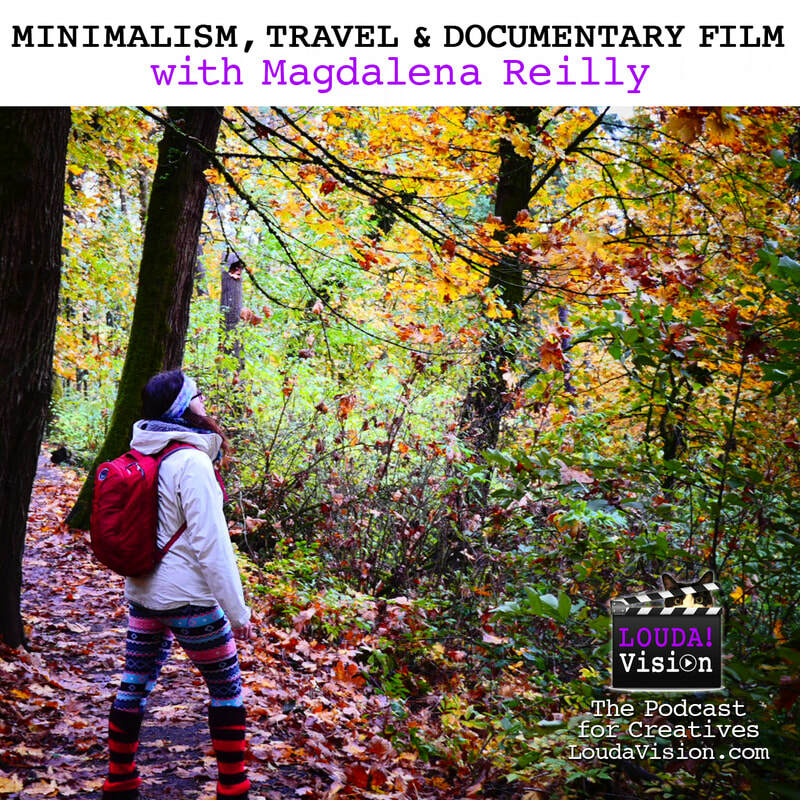 Magdalena talks about how packing her life into a backpack for this journey lead her to minimalism. We discuss how people can de-clutter space in their home, and in their mind. Also, cheap travel hacks and minimalist packing tips for filmmakers. Low White Sky is having it's world premiere at the Plebeian Film Festival in Tijuana, Mexico on November 3, 2017. Check out this article written by my students about the documentary class I had the pleasure of teaching this past summer. You will also see photos from my recent talk at Sacred Heart Greenwich. 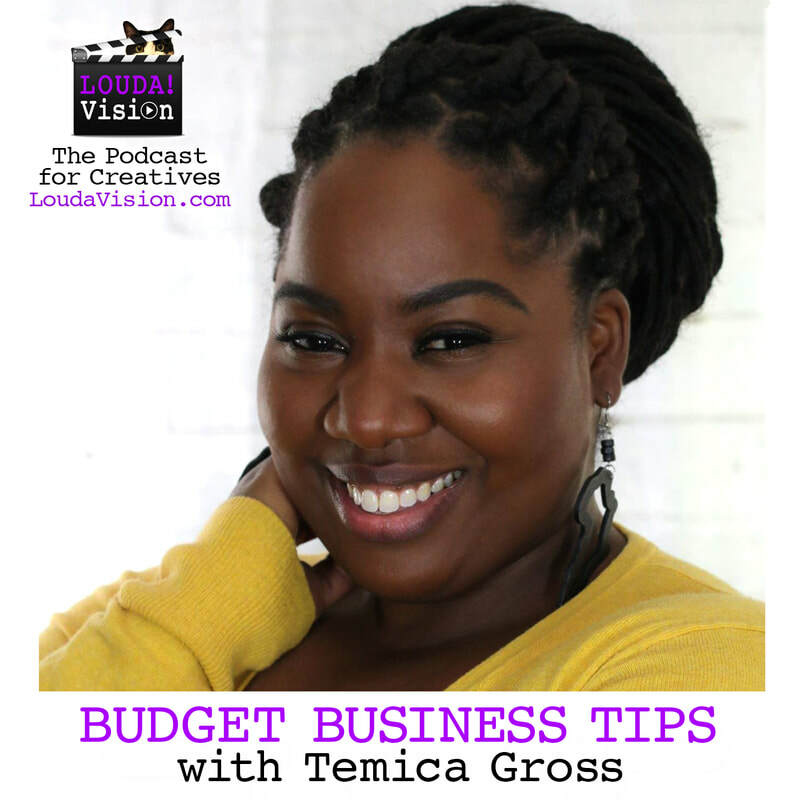 Temica Gross is a best selling author, speaker and coach providing creative entrepreneurs with the tools and resources to build their brands on a budget. This business expert has two master's degrees in business, so I pick her brain about finding your niche client, and creating a modern business in today’s digital times. She even explains how to get comfortable “inviting people to work with you”, AKA selling to people. Temica shares her cheat sheet for creating engaging online content, when to hire a virtual assistant and how to be a solo-preneur without going crazy. We get real about life after corporate- for people who have unrealistic goals and expectations about being an entrepreneur. Also, I share my experience with get rich quick schemes on facebook- which will hopefully help you avoid similar scams. Temica is an authentic, honest coach helping real people turn their vision into a successful business, without quitting their day job. She is proof that don’t need a wad of cash like Scrooge McDuck, to get started towards your dreams. Join me at Women in Digital NYC- I'm a featured speaker! I am so excited to be a part of the Women in Digital NYC panel. I hope you can join me! Join the 3rd Monthly New York City Women in Digital Meeting - this time, for a Panel Discussion and more opportunities to network. Our talented group of women is unlike any other you've ever joined and you'll experience it all during this event. 6:30 pm – 7:00 pm: Check in, mix and mingle! 8:00 pm – 8:30 pm: Group Asks + Gives Session - we'll break off into specialty areas to meet each other and practice some more "Asks" and "Gives." We are excited to announce our panelist, Aisha Harris, a Slate culture, film, and TV writer and host of the podcast Represent. Women in digital on both agency and brand side with a focus on digital media, marketing and tech (content, design, search, social, CMOs, sales, programmers or generalists – you are all women in digital). If you have a sales motivation for attending, soliciting our attendees and members for business or sales is strictly prohibited. If you do so, you will be kindly asked to leave. Not the guys. Sorry men, this event is exclusive to women only and those who identify as women. 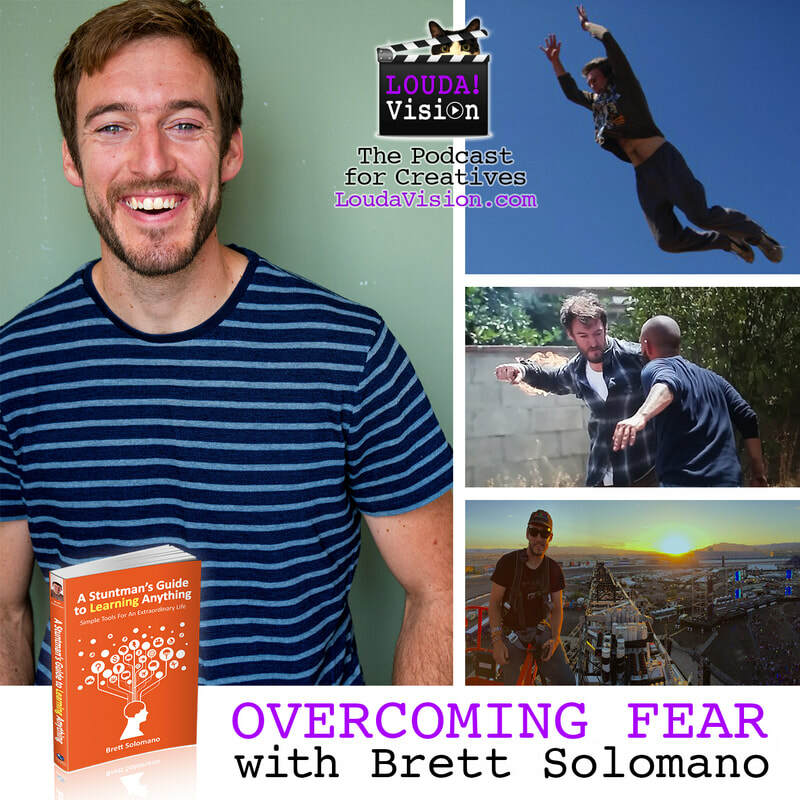 Brett Solomano is a Hollywood Stuntman, and an author, speaker and coach who helps people overcome fear. We speak about some of the scariest things he’s ever done, how to nudge towards the edge of our comfort zone “bubble”, and then bust out of that comfort zone! Brett explains how his study of meditation helps him to find clarity towards his goals, and why he suggests having multiple coaches with conflicting viewpoints. This freelancer explains how to build the habit of hustling and how to find flow as an entrepreneur. If your fear manifests as procrastination, you’re not alone. Brett also gives clues on how to identify your unique triggers and fear response signals to find solutions towards success. We speak about his brand new course “Momentum Mastery” which helps us conquer 28 fears in 28 days. It’s perfect for artists and entrepreneurs who want to gain clarity, learn what makes us feel stuck, and achieve massive wins. Brett is also giving a special discount to listeners of this show, so contact him and mention the LoudaVision Podcast! Learn to create a podcast for under $100: Click here to get 50% off for a limited time only! Teraj is an accomplished model, dancer, and social media influencer. He’s following his dreams and just recorded his debut album, Defy. You might have seen Teraj in music videos with Meek Mill, Wiz Khalifa or Miley Cyrus- or even on Million Dollar Listing! We chat about his humble beginnings and how he doesn’t let growing up “in the hood” define who he is or his circumstances. He explains how his upbringing actually had an impact on his success. He talks about how he pays the bills as a real-estate agent and model, to fund his life-long passion for music. Teraj gives tips for balancing multiple jobs as an entrepreneur. Also, we discuss how crowdfunding provided him the opportunity to produce deeply personal music with a positive message, influenced by superstars Whitney Houston and Michael Jackson. Don’t miss this episode of the LoudaVision podcast featuring Teraj’s debut single “We got each other” off his EP album Defy. I'm on the JumbleThink Podcast! Hello friends! Check me out on the latest Jumble Think Podcast where I chat with the awesome host Michael Woodward about my Freelance Experiment. Take a listen to learn about what's going on with me. He calls me an influencer, dreamer and maker- how cool is that! We chat about making creativity personal, and how I mix things up as a freelancer. Enjoy! Super big thanks to Michael for allowing me to be on this podcast and for the awesome conversation. Creating a film is more than just text on a page. As a screenwriter and/or director, we have to construct a fictional world using our unique perception of reality. This exploration of philosophy is the secret to a successful film. Learn how to turn life’s questions into a compelling story, and how to write a feature film. Galia Barkol is a NYC based Israeli filmmaker and actress sharing her experience creating her first feature film. We speak about how to act and direct at the same time by channeling energy on-set. Galia shares her inspiration for the film, origami, which she uses as a metaphor for identity, belonging and transitions in our life. We discuss various ways to spark your creativity, and how to turn a simple idea into a film. Learn about using popular music in your film, and what royalty free or public domain music means to you. We also explore the creative urge to switch genres after completing a big project, so we can re-balance and shift gears to something exciting. Before we meet today’s guest, I want to share a very special course I created so that you can have your very own podcast. If you’ve thought about starting your own podcast but you aren’t sure where to start or maybe you have a general idea but you need help getting it off the ground, this course is for you. If you use the coupon code, LOUDA, I’ll give you 10% off. For me, I started this podcast as a way to learn from people I otherwise would never meet and to have my voice be heard in a quick and easy way. I truly enjoy sharing what I learn with you and in the process, this podcast has boosted my confidence immensely. Even if you're shy, no worries, you can sit at home in your pajamas and still get your message out there. I cover multiple types of podcast formats and this course is designed to teach anyone to create their very own podcast. Any topic, any format for any reason. Go on over to LoudaVision.com and check out my quick course on how to hone your concept, create, record and share your very own podcast. It’s all online so you can go at your own pace, whenever and wherever you like. Don’t forget to use the special discount code, LOUDA, for 10% off. Attention! Don't miss LoudaVision Presents! 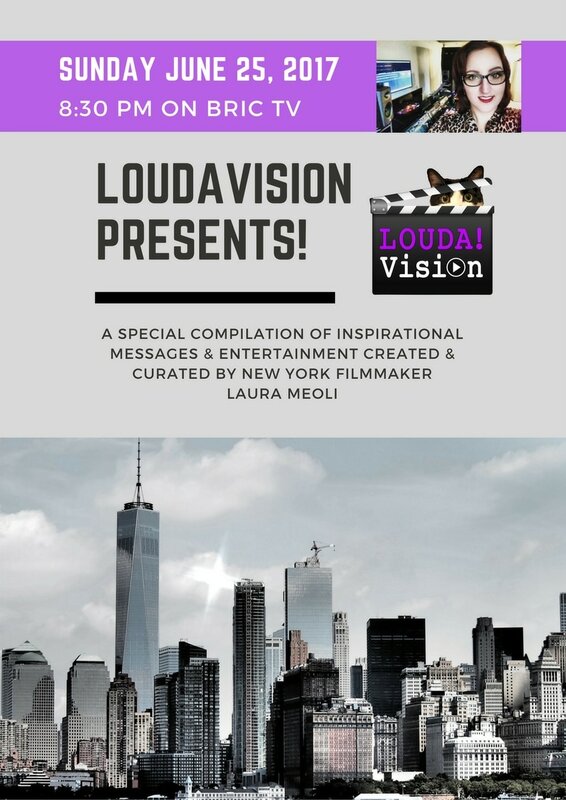 A special compilation of inspirational messages & entertainment created & curated by New York Filmmaker Laura Meoli. -Boys & Girls Club Documentary, "Water for Flint, Michigan"
-"Give a little": Telly Award Winning Short holiday film about gratitude & family which can be enjoyed all year round. -A special musical Performance by NYC band "Fall of the Albatross".